A cashmere turtleneck may be one of the more frequently worn articles of clothing in my wardrobe. This one is by Michael Kors. Paired with a twenty-five year old Harris tweed jacket and Bally suede monkstrap shoes, the combination is good for an easy and elegant day look. Especially when a tie isn’t required and it’s a bit blustery. The trousers are flat front, wool twill in a deep teal-charcoal that is echoed in the weave of the tweed. If I were to flip up the collar of the coat to ward off the wind you would see two buttons that are used to attach a throat latch. Throw a cap and a scarf into the mix and you’re ready for almost anything that comes your way. Except an Indian Summer afternoon. 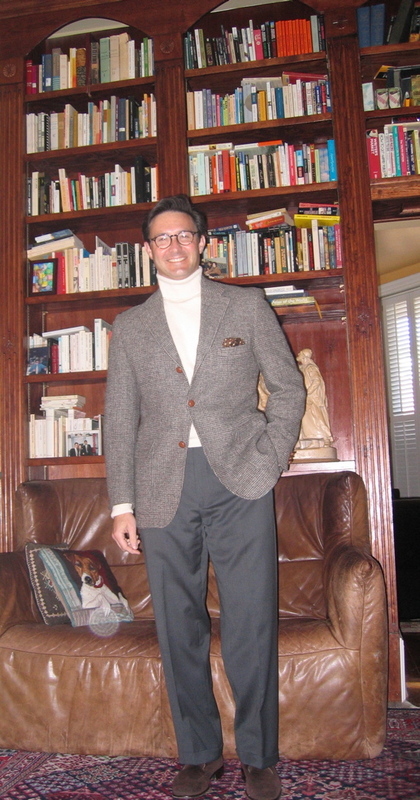 This entry was posted in Elegantology and tagged Bally, casual friday, Harris Tweed, MIcahel Kors. Bookmark the permalink. I get a kick out of your blog. A humble suggestion: I think they shape of your face would be better complemented by rectangular eyeglass frames. Try a pair on and see if that’s correct! Hello Digi and welcome. I have black rectangular frames that I wear to evening affairs. But these just had the prescription changed and are far more accurate. Once the market goes up again, I’ll have the second and third pairs done. thanks for the suggestion! Mrs. B,, thank you. It’s one of my favourites. Only, it’s a bit small…. they were stingy with the fabrics. Which means it can’t be worn as a neckerchief…. drat. I just came across your blog via Eddie Ross and I am truly inspired by your elegant and effortless classic style. You call to mind a forgotten era of dapper young men dressed to the nines. I grew up on Cary Grant, Rock Hudson movies, as well as the musical stylings of Fred Astaire and Gene Kelly, and I am so happy to see that men still dress like this today. Welcome Liz, I hope you find something of merit here. I, too, grew up on the same movies and they inspire me to this day.